We Are Really Excited To Share Our First Tutorial With You! We know that it's important to save money where you can, especially around the Christmas period, that's why we are showing you how to make an easy Christmas decoration. We're sure you'll fall in love and actually keep it up all year round! We recommend reading the whole tutorial before having a go yourself. If you do have any problems, get in touch and we will try to help you out. We would love to see your attempts so please share your photos on Facebook or Twitter and we may place them in a blog in the future. Pop in our shop in Bristol for the Crepe Paper and don't forget that our online party shop will be launching in the new year! Crepe Paper - Available in a huge variety of colours at Flingers for £1.39. We chose a festive silver. Wire - We got ours from a florists but you can use any you might have around at home, it doesn't matter how thick or thin it is as long as you can bend it easily. Wire Cutters - If you've got quite thin wire, scissors might be sufficient. Scissors - For cutting the crepe paper. String - If you want to hang them up like we have. 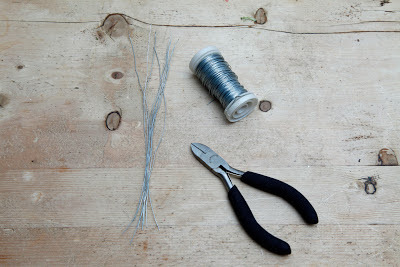 Cut your wire into 15cm strips. We cut 10 because you can make 10 flowers out of the crepe paper we used. 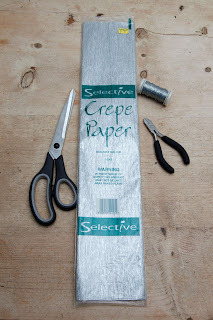 Take the crepe paper which is already folded into a long rectangle and cut along the two long sides, placing one of the scissor blades inside the folds of paper and the other blade on the outside. Repeat on both sides until you have two piles of long rectangular paper, 5 or 6 sheets in each pile is sufficient. Cut 10cm long strips until you've used all the paper. This should give you 10 piles of paper squares. Take one pile of square paper and fold about 1cm of paper over. It's best to go with the grain of the fabric or just try both ways and see what folds easiest. Then turn the paper over and fold another 1cm so you make a zig-zag fold of paper, continue doing this till you've used all the paper. Hold it tight as it can easily pop open. Get a piece of 15cm wire and, with 3cm excess, bend the metal around the folded paper right in the middle. This will hold it in place. Twist the excess around the other bit of wire and it should hold by itself. Take your scissors and cut off the edges to create points at either side. This will give your flower more of a relaxed edge. It's sometimes quite hard to cut through so many layers so sharp scissors are best. Now we start to see it coming to life! Ensuring the wire is tight enough to hold it in place, open up one side of the paper and then separate each leaf of paper. This is the tricky part as sometimes you have to be quite forceful to get the paper to separate towards the base where it's held by the wire. Just be patient and remember the paper can rip quite easily. 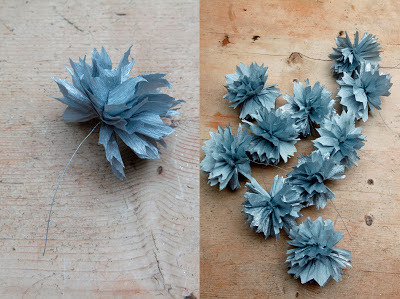 Keep separating each leaf until you've done both sides of the flower and continue to do it to the rest of the paper until you've got 10 lovely flowers ready to put on the garland. Don't fancy putting your flowers on a garland? 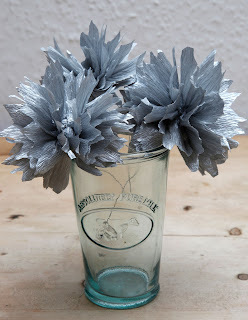 Just keep them as they are and put them in a vase or bend the wire to attach to anything around the home. 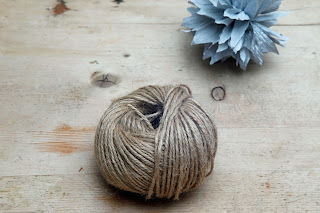 We used some rustic brown string, but use ribbon/white string or anything you fancy! Cut the string to approximately 250cm long - suitable for 10 flowers. 25cm in, place the string over the top of the wire on one flower. 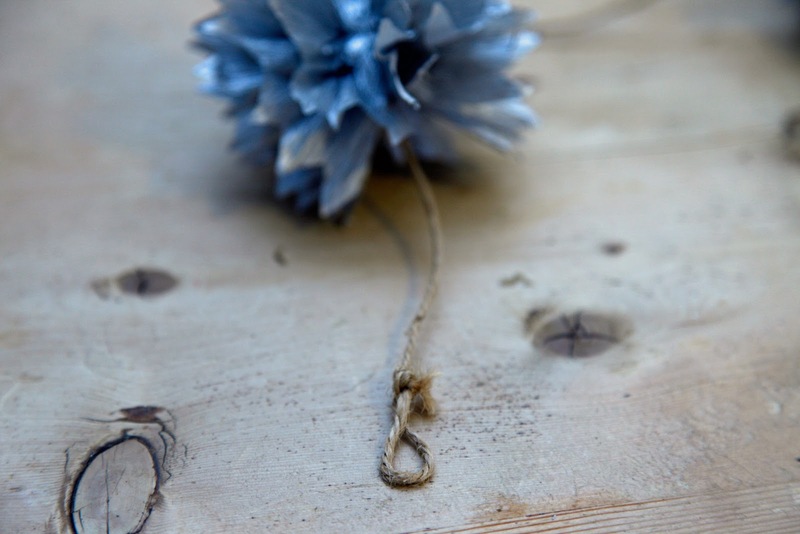 We need to attach the flower to the string so simply twist the wire around the string a few times. This is where the thinner the wire, the easier it is. Be careful of the edge of the wire that has been twisted round as it's normally sharp. Cut off excess wire. Continue this process every 25cm. 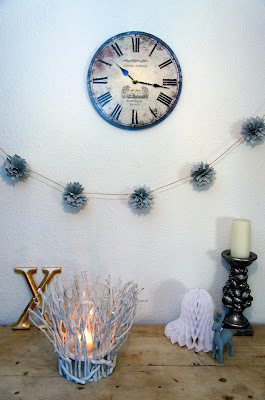 Don't worry how messy you are attaching the flowers, as long as they won't fall off the string - it's fine. Just make sure the paper covers any joins. We tied little loops into either end of the string so we could easily hang it up. And you've made a beautiful christmas decoration! We love it alongside our Paper Bell Christmas Decoration, available now for £1.59. Why not experiment and try making different sizes? Create a single massive flower as a statement piece or make tiny ones for Christmas tree decorations.